—Scott Russell Sanders, author of Hunting for Hope and Staying Put. —Judson D. Hale, Sr., Editor, Yankee Magazine and The Old Farmer’s Almanac. —Rosellen Brown, author of Before and After. —Sue Hubbell, author of A Country Year and Waiting for Aphrodite. "Back when I went to school, there was an administrator, a vice-president of something or other, who was given to rough-hewn statements, the kind of homilies that were meant to show his populist stuff. He was particularly set on tearing down the wooden houses on campus. They just weren't practical. We said: They can be repaired. There are wooden houses that have stood for hundreds of years. And all buildings, no matter the material, need repair and renewal. 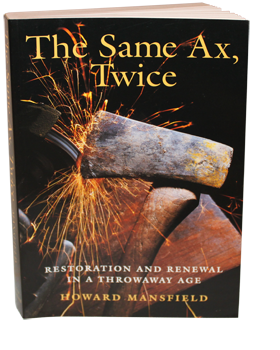 He said: I know a farmer who says he has had the same ax his whole life—he only changed the handle three times and the head two times. Does he have the same ax?"